Some of the tiles are up and I am delighted with how they look. We have a few little things to iron out with tiling under the window but I’m sure we’ll sort it out tomorrow. Everything for the upstairs bathroom is here too which is great. F is finally feeling a bit better after a trip to the docs this afternoon. He has literally slept for two days but now he is ‘managing’ to play minecraft so I’m guessing calpol and antibiotics are doing the trick at last. I’m looking forward to seeing the bath upstairs in place and everything coming together. Then there will be the almighty sorting of stuff and probably more trips to the dump. Hey ho. 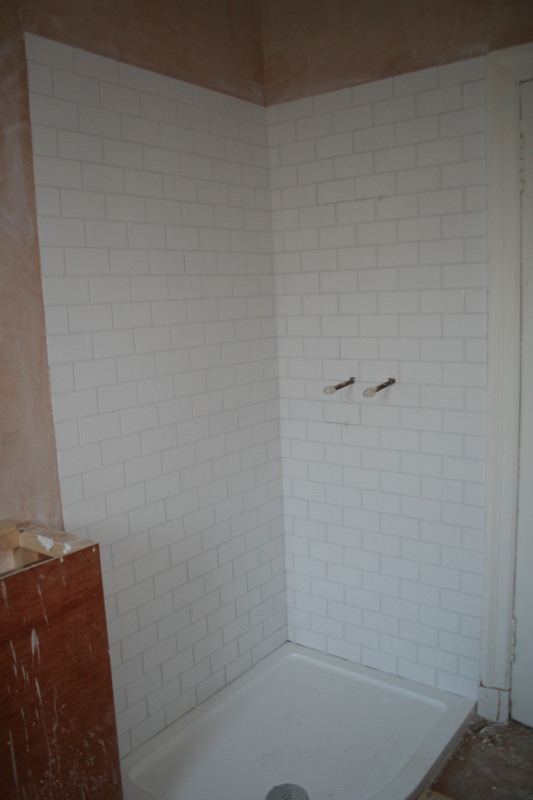 tiles look fab – won’t be long till you can have a shower again! Might not smell so bad soon you mean!! !